For 5,000 dollars, a computer will scan your brain several times while asking you a series of banal yes or no questions: Do you live in Texas? Is it 2004? It will also ask you one important question, such as: Did you burn down the shop? Or, have you cheated on your spouse? Shortly thereafter, it will spit out two numbers. And the creators of the test insist that those two numbers will determine if, when you answered the serious question, you were lying. This method of lie detection, which relies on brain scans rather than a racing heart, still hasn’t gained widespread support among mainstream neuroscientists or the legal community. But two companies, Cephos Corporation in Tyngsboro, Massachusetts, and No Lie MRI in San Diego, California, are already marketing it to clients, at a time when many experts worry about the technique’s accuracy in detecting real-life lies, as opposed to the fibs conjured up by study volunteers in experiments. And even if the test is reliable, experts question whether the results of this sort of mind reading should be admissible in court. Steven Laken, president and chief executive of the eight-person start-up Cephos Corporation, says he believes this sort of brain data has a “strong possibility of being introduced as evidence” in the next couple years. Cephos is shooting for a benchmark of 95 percent accuracy in results, he says. The company got close to the mark in a 2005 study published in the journal Biological Psychiatry. In that study, they asked 31 subjects to steal a ring or watch and then lie about the object they took. Cephos detected the lies with 90 percent accuracy. Cephos’ test relies on functional magnetic resonance imaging (fMRI), a technology that measures changes in blood flow to different areas of the brain over time. Working neurons require more oxygen and thus more blood, just as working muscles do, so by tracking blood flow, fMRI shows which areas of the brain are most active at any particular moment. Many fMRI studies have concluded that a few key areas of the brain are more active during deception than truth-telling. These include the anterior cingulate cortex, which is involved in attention and monitoring processes, and the left dorsolateral and right anterior prefrontal cortices, areas of executive function involved in working memory and behavioral control. Cephos pays particular attention to blood flow in one thousand “voxels,” or three-dimensional pixels measuring brain space, in the brain regions associated with deception. (The entire area of the brain can be represented by about ten thousand voxels.) The computer provides two values indicating how many of those spaces, out of a thousand, are activated when a person admits or denies allegations. Legal scholars are both interested and alarmed by fMRI’s potential use in detecting liars. Henry Greely, a bioscience ethicist at Stanford University, thinks the technology “has the potential to really screw up people’s lives.” Some companies, he says, are touting the accuracy of their tests based on unrealistic scenarios. Greely mentioned one commonly cited study in which researchers asked 26 right-handed male undergraduate volunteers to lie about holding either the five of clubs or seven of spades. “How similar is that to telling the cops ‘No, I wasn’t there’ during a crime?” he asked. The study to which he refers was published in the journal Human Brain Mapping in 2005. 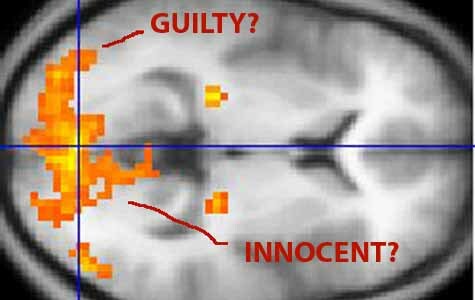 If prosecutors try to get the results of fMRI lie detection tests admitted into court, they can expect a challenge based on the Constitution’s ban on self-incriminating testimony, according to Kenneth Foster, a bioengineer who is also associated with the University of Pennsylvania’s neuroethics program. Using brain scans as evidence in court cases involving adolescents. Listen to a round-table discussion on the ethics of lie detector tests. Inside the Autism vaccine court. hmmmm… i actually dont like this. not kidding!! We the people should make it a priority that truth and then maybe justice are in our courts today. I would think with the technology we have, lie detectors could and should be so close to 100% accurate, and a very big part of our judicical system. Imagine how it could change our society. I find this very impressive. If lie detectors arn’t 100% accurate then there is no way we could and should use them in court. Even if there is just a 1% error rate, that mistake could be critical. The lie detector would have to pursuade the jury quite a bit, and if it just so happned to be wrong that could mean a wrong person in jail for a crime they didn’t commit. Well, 100 % is a lot. I must say. even we humans can’t utilize 100 % of our brains which is just 1.4 gm in weight. the world is not perfect .If however the results shows above 90 % I believe it should be taken into consideration. even judges are biased.. beleive it or not a black man has more chance of being convicted for a crime compared to a white man for the same crime. our best may not be perfect. but its the best we got ! !